Hitchcock never forgave Vera Miles for marrying Scott; but come on who was going to say no to those thighs? You said it - or that chest!? That crotch could rule the world!? In the last years of his life, he lived with fans, Roger and Betty Thomas of Baltimore, Maryland. They invited him for a visit, he liked it a great deal and, then, somehow, he never left. 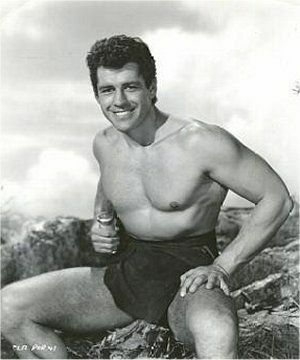 Gordon Scott is buried in Kensico Cemetery in Westchester County, NY, same cemetery as Rachmaninoff, Soupy Sales, Anne Bancroft, Harry Davenport, Ann Shoemaker, Judith Evelyn, Billie Burke, Florenz Ziegfeld, and Fay Templeton, who will always be "45 Minutes from Broadway." When they traveled to Hollywood, Roger and Betty Thomas tracked Gordon Scott down, because Mr. Thomas had become such a fan over the years. When they left, they invited Gordon Scott for a visit to Maryland. I wish that the Thomases would write a book - "Our Years With Gordon Scott". He had a great smile. I don't remember many of the other Tarzans being all that smiley, but Gordon had a mega-watt smile he wasn't afraid to use. Beautiful guy. 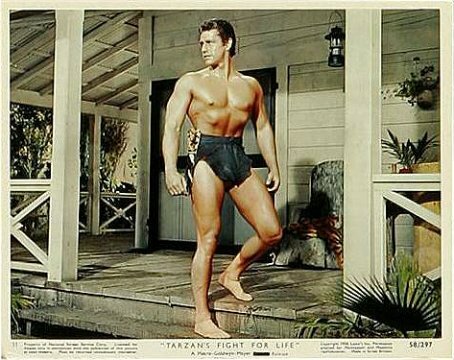 Gordon Scott re-did his body for "Tarzan's Fight For Life" and the results, especially that chest, were awfully impressive.